Welcome to our FIRST ever Blog Hop sponsored by Mountain Plains Crafters !! The theme is Christmas in July.. How fun is that ?? To play along, you need to visit all of the blogs listed below and comment on each one. Once you do this, you will be entered in the drawing for a Clearsnap prize pack. 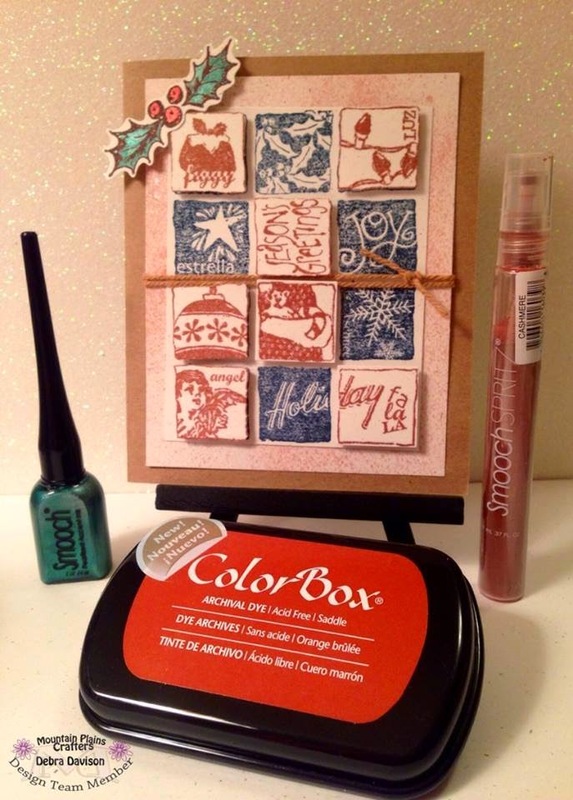 Clearsnap makes wonderful products, including Colorbox Ink Pads, Smooch, Smooch Glitz and Smooch Spritz. Clearsnap products were used on all of the cards in each of our blogs that you will visit. So grab a cup of tea or coffee, relax and visit each one. Get some early Christmas card ideas and leave a comment on each one for a chance to win some great products. The hop will last for 2 days - Friday the 25 and Saturday the 26. I will also be giving away a prize pack for those who follow and comment on my blog. The winner of my giveaway will be announced here and on my Facebook page on Sunday, July 27 so be sure to check back. I hope that my card gets you in the Holiday Spirit..... I used Smooch "Spruce" to color the holly leaves-it is so much fun to "paint" with and has a great brush for detailed work, The Smooch Spritz "Cashmere" is a fine spray that is shimmery and amazing !! And I'll admit I was a bit intimidated by the Colorbox Ink Pad in "Saddle". Wasn't quite sure I could do that gorgeous color justice on a Christmas card. But I used a favorite Inkadinkado stamp, popped up some of the collage elements with dimensionals and really love how it turned out.. A bit of May Arts Twisted Burlap Ribbon was the perfect finishing touch !! Next up in the Blog Hop is Jennifer Leamy Loftfield. She is an amazing crafter and one of my new "sisters" from another mother !! Check out Caffeinated Papercuts - leave a comment about her Christmas in July project and she will then direct you to the next stop in the hop !! Clearsnap was so nice to sponsor the prizes for this hop, so be sure to "like" them on Facebook. Also Hydrangea Hippo does publicity for Clearsnap and will be promoting our Blog Hop so be sure to go and "like" her Facebook page too.. Listed below are all of the blogs of the Mountain Plains Crafters team... I hope you will follow each of them as we take this creative journey together, not only with our first ever Blog Hop but throughout the year. What a wonderful card. I love the collage look. The twine looks great. What a fun image to use. You did a great job with these products. Thanks, Marilynn !! I love collage stamps too !! This card is wonderful! I love the popups on the college. I always love popping elements up on cards !! Thanks for joining our Blog Hop !! Oh Debra, it looks great!! I love how we each used holly and twine, hehehe. very nice dad.I like how you incorporated the blue. Well done. Thanks !!! I love doing that with collage stamps !! I really love how you stamped part of a stamp on one square and then on another for continuation. I gotta try that! And I love love love smooch spray! it looks great! Fabulous dimension. Love how you used the colors!! And what a great photo. Thanks, Pam.... I love yours as well...... Glad you liked the colors--I wasn't too sure at first so your comments helps alot !! Love the quilted look and depth of the card! Creative how the stamps went into two squares! Pretty card! This is one of my all-time favorite stamps !!! Thanks so much !! Love the rust and blue colors combined into one card. Very pretty. the scrap squares are a great idea. the hop has been great. Thanks so much, Mary Lou !! I am so glad you enjoyed it.. We had so much fun with it !!! great idea on this page!! Thanks so much.. Hope you will keep following !! Congrats , Ruth !!!! Enjoy your goodies .. We all certainly enjoyed being creative with our Clearsnap products !! Fun card! I love to play with squares on cards, it makes such a puzzle piece, really makes you look scene. Great card design using these products. Thanks Sue ,,,,,, I appreciate you following my blog . It is certainly a labor of LOVE !! Thanks , Karen ...... I really appreciate that and hope you got some great ideas ! !